With its compact size, many trem variations and a usable boost, this is a must-try pedal. 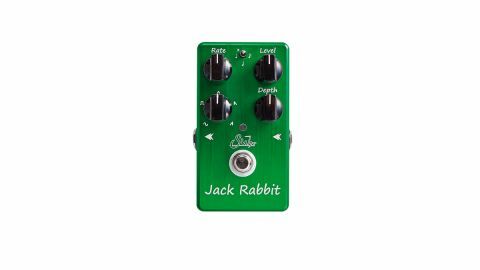 Despite its compact size, the Jack Rabbit packs plenty onboard. In addition to the standard rate and depth knobs, the output level knob can go from unity gain to supply 14dB of boost, which can really drive an amp into overdrive - turn down the trem depth to use it as a pure boost. The modulation waveform is also variable with Sine, Square, Triangle, Reverse Ramp and Ramp shapes for a range of sounds from rounded Fender-style throb through to harder-edged on/off stutters. If you want to change speeds on the fly, two tempo modes with three subdivisions (quartet note, eighth note and quarter note triplet) are possible by holding down the footswitch for two seconds. There's normal Tap tempo and a Strum tempo mode where you set the tempo with three strums, and the option of control with a remote footswitch, too.